Enter to win a $2,200.00 Fall Fashion prize. $300 Glow Recipe Gift Card, $500 High Fashion Home Gift Card, Pair of Shoes from Italist, BCBG Max Azria Prize Package, $300 Mejuri Gift Card, and $200 VISA Gift Card. 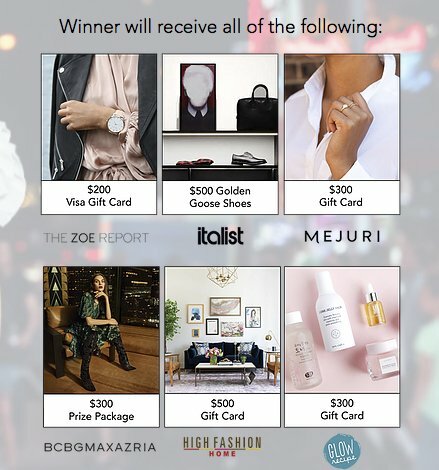 $300 Glow Recipe Gift Card, $500 High Fashion Home Gift Card, Pair of Shoes from Italist, BCBG Max Azria Prize Package, $300 Mejuri Gift Card, and $200 VISA Gift Card.